In our warm climate, Lisianthus are easy to grow, and a plant that comes from the prairies of Texas and Mexico should be fairly tough and hardy. You can grow then from seed, or you can buy small seedlings in most good nurseries in spring. Here they are simply known as Lisianthus, they have been recently renamed as Eustoma, they also have common names of Prairie Gentian and Texas Bluebell. With rose shaped flowers and come in a wide range of colors. These are a plants that do well in deep pots, cut back after flowering to promote a second flush of flowers. They are much sought after as a cut flowers and are popular with florists for use in bridal bouquets. They are often sold as an annual, and are commonly grown from seed, or seedlings. The colourful hybridised varieties from Japan and the Netherlands that are in demand from gardeners and florists alike. Treated as an annual, they are drought tolerant and tall growing. As they are heavy flowering plants Lisianthus require a fair amount of fertilizer. Used widely as cut flowers, cut them close to the base of the stem, they will re flower in a month or two. Popular both in the garden and as cut flowers Lisianthus are colorful and make a great addition to the garden border, or they can be grown in containers. Lisianthus or ‘prairie rose’ are a colorful garden plant and are really not that difficult to grow. The flowers are used widely in corsages and other floral arrangements and are are suitable to grow in pots. Remember that these are the native flower of Texas (the Texas rose) and are originally from the dry prairies, they are used to hot dry conditions and cold evenings. If you wish to grow them from seed, the following technique works well. Start by sowing seed in late winter to spring. Seed should be sown once the weather warms up, or indoors. Use a heat matt to provide some bottom heat. Once the seeds germinate, remove them from the heat matt. Harden them off and then plant them out once the weather warms up. Full sun in a humus rich well drained soil is the best position. Do not to mulch around the plants as this promotes fungal problems..
You can collect seed for replanting the following year. Lisianthus make great cut flowers. Lisianthus grow naturally along river beds in desert areas and are actually fairly deep rooted, the root system searches for water below the dry surface, so although they grow in dry areas they do require access to water. Height 30 cm to 1m depending on variety and soil. Minimal watering will be required. A deep watering every 2 weeks is adequate, do not water overhead. Use in the general garden border, or plat in containers. Also use in a cutting garden where the long lasting flowers are welcome. Common Names – Texas Bluebell, Lisianthus, Prairie Gentian, or Lira de San Pedro. Country of Origin – U.S.A. Climate Zones – Warm Temperate to Mediterranean. Soil – Tolerates a range of well drained soils, requiring a slightly alkaline soil to grow well..Height –Long stemmed flowers to 30cm to 60 cm 1 – 2ftSpread – Erect. 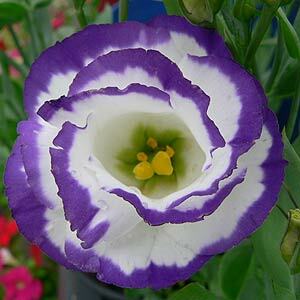 Flowers – Lisianthus come in a range of colours, Whites, Yellow to Pinks and Purple with multicolour as well. Flowering Time – Spring to Summer is Lisianthus season..
Root system – Non – invasive. 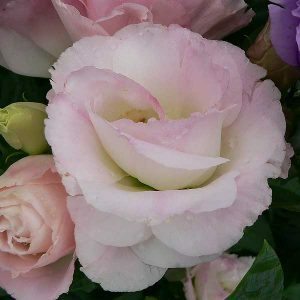 Lisianthus Plants and seeds are available for sale from listed, Mail Order Nurseries. Although they are often a little difficult to grow from seeds.